In short, the Photo Tool doesn't take eyes into consideration. But the eyes height is one of the main requirements in the US visa and passport photo. Also it is implemented in Flash and thus is not OK for most phones, tablets and some desktop computers. Below is a more detailed description and information about the alternative service at Visafoto.com. 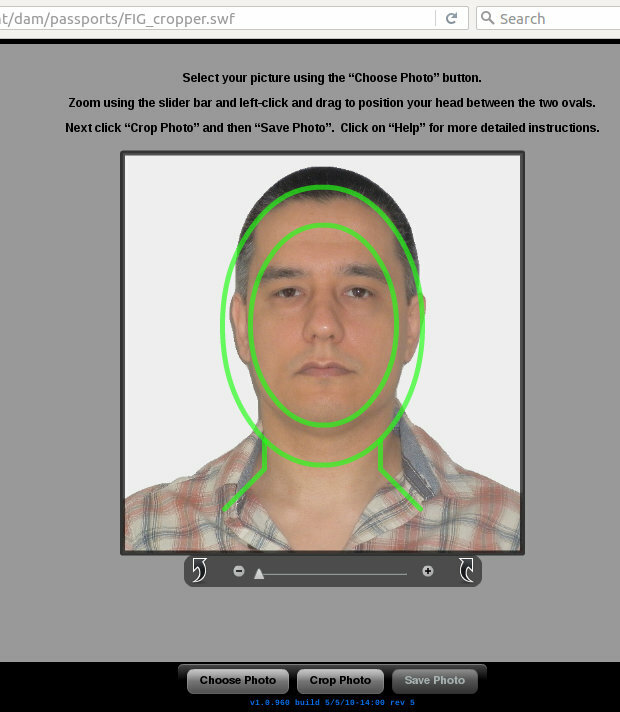 The Photo Tool is not related to the internal software that is used by the US Department of State to validate US passport and visa photos. It does not share code with that internal software. Thus 'failing' or 'passing' in the Photo Tool does not mean your photo is either correct or incorrect. The Photo Tool is designed in Flash, and thus does not work on iPhones, iPads and many of the Android phones. It also doesn't work on Mac and on some web browsers on Windows. The Photo Tool can be used both for photo cropping and validation and because of its shortcomings may do both of these functions incorrectly. The Photo Tool leaves your background intact, does not fix it, and you need to have a really good uniform light background on your original photo that you are cropping with the Photo Tool. There is no image rotation facility, so again you need to hold your head really straight on your original photo to make a good result. Fact: the Photo Tool doesn't always (a) create correct US visa photos and (b) doesn't validate lots of correct photos that fully meet the requirements. We noticed this from complaints of our users and over time have accumulated lots of examples of its incorrect work. Moreover, if we use the best photo settings with the head size just below the allowed maximum, then it is pretty likely to 'fail' validation in the Photo Tool. The Photo Tool uses an oversimplified approach with 2 green ovals. But it is not aware of eyes at all, and thus it lacks a vital part of validation and cropping. The eyes height parameter defines the vertical offset for the head position on the photo. Since the Photo Tool misses the eyes altogether, it may only make a guess where the head should be laid out vertically. All people are different, some have high or low forehead, some have voluminous hair; and the distance between the bottom and the eyes may differ drastically given the same head height. Thus the eye line height requirement may fail even if the head fits the ovals. In this example the image has head size of 1.29" (allowed 1-1.375") and eyes to bottom of 1.31" (allowed 1.125-1.375"). Yet it doesn't fit the biggest of the green ovals. This is because Visafoto follow the guidelines in full. First, we measure the head and scale the photo to make the head just below the allowed maximum (i.e. just below 1 3/8 inches). Then we shift the photo to make sure the eyes are just above the allowed 1 1/8 inches from the bottom. And then we crop the photo at 2x2 inches at 300 DPI (to make it 600x600 pixels). This is why we always pass at the US Department of State website. You can use it to make US visa photos, DV lottery photos and US passport photos.